Chocolate is be very temperamental but the right technique and process can save you a lot of headache, valuable time and give you the best results. This simple, easy and effortless tips for melting and working with chocolate will make sure you enjoy working with chocolate every single time. Today I have a very special guest post for you. Someone very talented and generous. Her name is Katrien Van Zyl of Katrien’s Cakes. If you remember recently I shared a review of one of her excellent books Scrumptious Recipes and Original Chocolate Decorations. Katrien Van Zyl is a qualified Home Economist and has been baking specialty cakes since finishing university. She worked in the hospitality industry for 8 years after which she started baking full time. Her first book, ‘Katrien’s Cakes (Decorating Cakes with Chocolate) was published in October 2011 and her second book ‘Katrien’s Mini Cakes has won the GOURMAND award for best Pastry and Sweets book in South Africa in 2013. She will be publishing 3 more books next year: Crafty Tray Bakes, Dessert Cakes and a UK book by Search Press called Twenty to make Brides and Grooms. 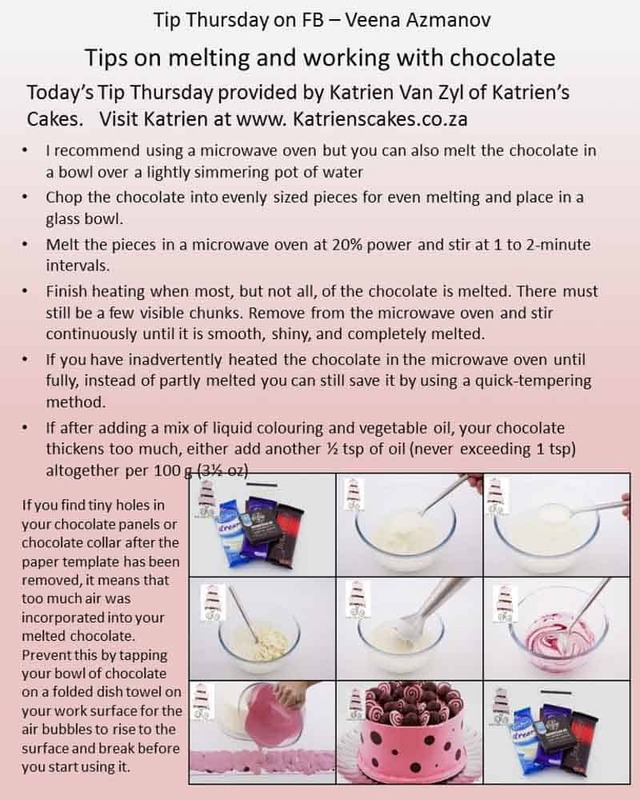 I wanted to share with you her simple and easy Tips on melting and working with Chocolate she shared in her book. So I requested her to share today’s Tip Thursday. 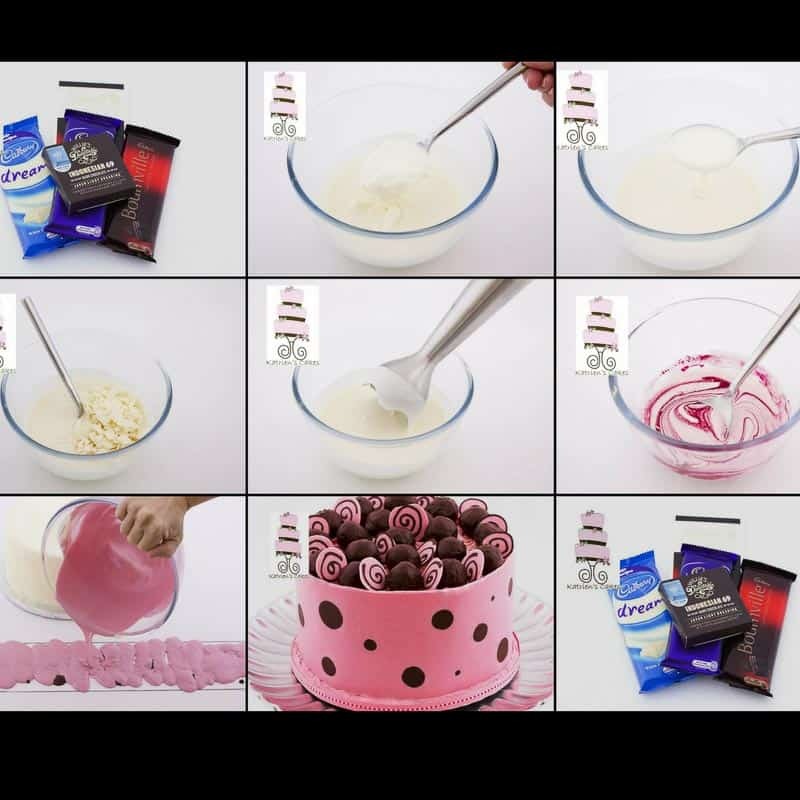 I thought it would be nice to extend our very popular Tip Thursday to some special and talented cake decorators and ask them to contribute something over the coming Thursdays. I do hope you will love these tips and I do hope that you will find many new cake decorators to admire and follow. Be very cautious when heating chocolate so that it does not overheat or burn. Chocolate scorches and spoils easily, becoming lumpy and grainy. Melting chocolate requires a very gentle heat and lots of patience! I recommend using a microwave oven because it is easy and fast, but you can also melt the chocolate in a bowl over a lightly simmering pot of water (but do take care that none of the condensed steam drips into the bowl or the chocolate will clump up or seize and become unworkable). 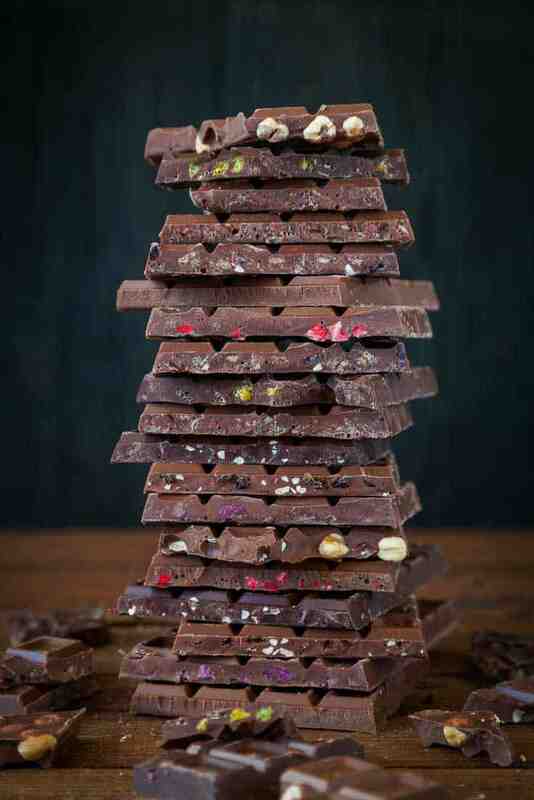 The chocolate can also be melted in an oven set at its lowest temperature, or on a hot (warming) tray. 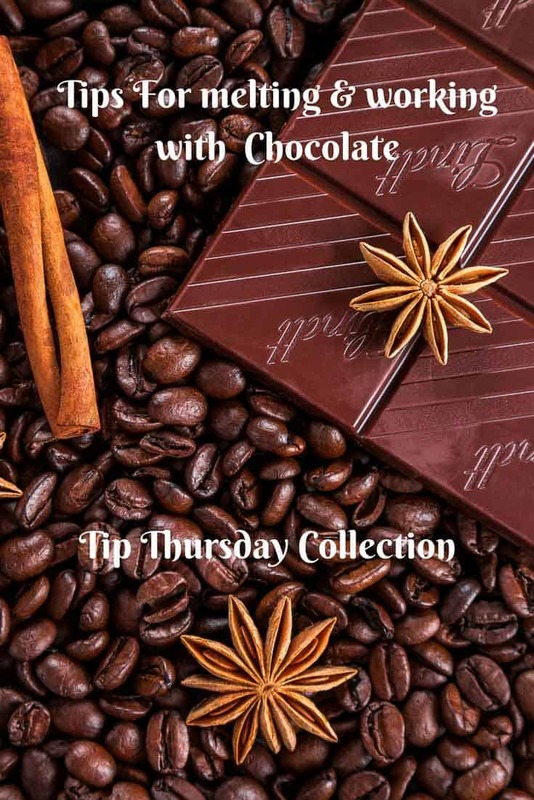 Chop the chocolate into evenly sized pieces for even melting and place in a glass bowl (glass keeps the heat of the chocolate longer than plastic does). Melt the pieces in a microwave oven at 20% power or on the Defrost setting and stir at 1 to 2-minute intervals. Finish heating when most, but not all, of the chocolate is melted. There must still be a few visible chunks. Remove from the microwave oven and stir continuously until it is smooth, shiny, and completely melted. If you have overheated your chocolate and it has lost its shine and become grainy, immediately pour it into a cool bowl, add chunks of solid chocolate, and stir continuously. You might save your whole batch that way. If you have inadvertently heated the chocolate in the microwave oven until fully, instead of partly melted you can still save it by using a quick-tempering method. 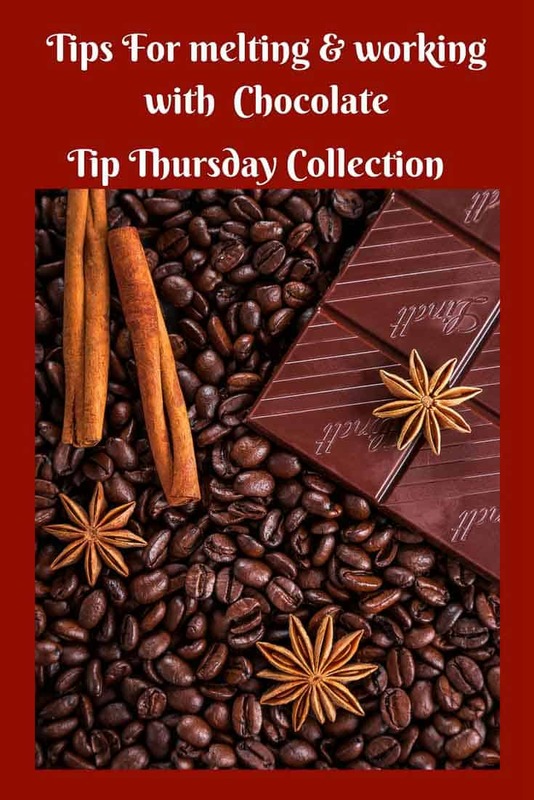 Add 1 tbsp or up to ¼ of the original weight of chopped chocolate into the fully melted chocolate and stir continuously until it is smooth and completely melted or quickly mix it in with a stick blender. If your melted chocolate seizes because it has come into contact with liquid, the only way to save the chocolate is to add more water, cream or milk until the mixture becomes a syrup. Unfortunately, this chocolate syrup cannot be used as pure chocolate for decorative purposes any longer, but can be used in a variety of other recipes. If after adding a mix of liquid coloring and vegetable oil, your chocolate thickens too much, either add another 2.5 ml (½ tsp) of oil (never exceeding 5 ml (1 tsp) altogether per 100 g (3½ oz) and stir, or add 15 ml (1 tbsp) of chopped solid chocolate, put the bowl back in the microwave oven and heat at 20% power or on the Defrost setting, stirring at 20-second intervals until the chocolate is spreadable. Note that you can still spread the chocolate even if it’s not runny. Don’t forget to visit Katrien’s Facebook Page and check out her work as well as visit her blog to check some of her other post and recent books. She does often have the option to enter for the opportunity to win a copy of her book. Might be a good idea to follow her blog and get lucky. Multumesc foarte frumos pentru sfaturi,esti o artista,iti doresc sanatate si fericire,ai maini de aur. Thank you Veena for sharing your knowledge with us. It is most encouraging and helpful.